"Into the Wild Green Yonder Part 2" is the eighty-sixth episode of Futurama, the fourteenth of the fifth production season, the fourteenth of the sixth broadcast season and the second cut from Into the Wild Green Yonder. It aired on 30 August, 2009, on Comedy Central. Leela joins the Feministas, while Fry is recruited to the Legion of Mad Fellows. After a quick recap of the previous episodes, the distraught staff of Planet Express arrive in the desert to begin searching for Bender's remains. They quickly find them as Bender and Fanny aren't dead, because the whole ordeal was purely a warning. 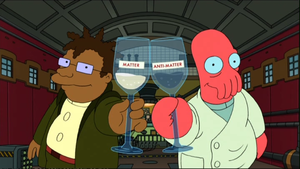 After the start of the introduction and a new caption, Hermes and Zoidberg stand in the hangar and say "previously on Futurama" then clink champagne glasses labelled "matter" and "anti-matter" together, causing an explosion before the recap begins. Leo's targeting of the golf ball canon at Hydra is shorter. Leela's "Well, there won't be any imploding once they read our environmental review." loses the "well". When Nixon is instructing Agnew in his swing, the first sentence doesn't start with "now". The Feministas' chant has one less "save the ecosystem" at the end. When the Feministas are hiding out, Frida doesn't ask "Now what do we do?" When Nine is explaining the situation to Fry, after silencing Hutch he doesn't say "You shall learn more in time, Fry. But..." Nor does he say "and our enemies would know of our existence," after telling Fry that Leela's thoughts would be read. Leo's thoughts heard by Fry don't include "Security guard gotta be tough." Sal doesn't tell the "hookers" that "This is [his] turfs." During the news, Linda isn't caught off guard talking to Morbo, as such we don't her her say "So you make more than twice what I do. What?" Sub commander L doesn't refer to herself as "den mother of the Feminista Revolutionary Collective". She also doesn't say the leech has a right to exist "because it's a part of nature." A third portion of the speech that is removed is "We call on women everywhere to join our struggle against eco-chauvinist Leo Wong. We especially need good communiqué writers." After Bender steps into the Room, Kif blows into a trumpet, producing a flag that reads "to be continued...". This page was last edited on 22 August 2014, at 20:33.